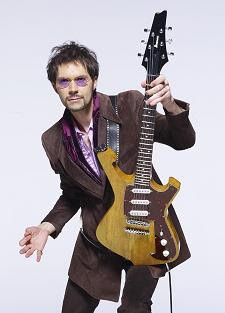 CDJapan will offer limited-release official bootlegs of all four shows on Paul Gilbert and Freddie Nelson’s mini tour of Japan. As an avowed CDJapan junkie, this makes me kinda dizzy with glee. And you can CLICK HERE to buy Paul and Freddie’s CD, United States, from CDJapan. And apologies for the link overload, but you can CLICK HERE to preorder the new Ibanez PGM401 guitar from Thomann.de. I’m planning to buy the hell out of these bootlegs. United States was one of my favourite CDs of 2008, and I can’t wait to hear how it translates in a live setting. Are you going to NAMM? If so, I’m insanely jealous and maybe somehow I’ll make it there next year. Peavey has released details of their endorsers’ NAMM appearances, and the press release is below. Most interesting to me is Devin Townsend, who has recently been photographed with a Peavey HP. Devin has used Peavey 5150 amps but most recently was seen using Mesa Boogie. Could he be going back to Peavey for amps? Is he leaving ESP for guitars? Also of note is that Joe Satriani will be officially launching his new Peavey JSX amp. The one you can read about here. Anyway, here’s the press release and schedule. Legendary guitarist Joe Satriani will introduce his new signature Peavey JSX guitar amplifier during a special press conference during the NAMM (National Association Of Music Merchants) show on Friday, January 16, at 1 p.m., in the middle of the Peavey exhibit (5740) at the Anaheim Convention Center in Anaheim, California. Rock and Roll Hall of Famer Gary Rossington and metal legends Max Cavalera (SOULFLY, SEPULTURA), Alex Skolnick (TESTAMENT), David Ellefson (MEGADETH) and Greg Christian (TESTAMENT) are also slated to appear during the show. CLICK HERE to buy Devin Townsend albums on Amazon.com. CLICK HERE to see Peavey JSX items on eBay.